We are commanded to behold Christ’s body, think upon his pains, and behold for ourselves how he is nailed to the cross (although I think there is also a nice pun here on ‘biheld þi self’: behold ‘for yourself’ but also behold ‘your own self’ in Christ’s image, as the poet goes on to relate the crucifixion to the viewer’s own sins). The poet creates a moment of pause and reflection in our busy lives in which we are advised to stop, to stand as still as stone, and contemplate Christ’s agony. And þou sall get my grace. In the final stanza, Christ exhorts the reader/viewer to behold his head and feet, and refrain from further misdeeds. Beholding his grisly face, we must ask for remission (‘aleggance’) from our sins and to have ‘affyaunce’ in God’s mercy. In Middle English ‘affiaunce‘ means confidence, assurance, faith, and trust. The second definition, however, includes ‘a solemn promise, a pledge of loyalty’. If we have faith in Christ’s mercy, therefore, he promises us his grace. It is a reciprocal relationship. (Behold my head, my hands, and my feet, and fully feel now, before you leave, if there is any mourning that is equal or mischief that can be measured unto mine). Here the playwright draws on Lamentations 1:12, a text that was recited in church on Good Friday and that asks ‘if there is any sorrow like unto my sorrow’ (which I can’t help singing to Handel’s tune in the Messiah!) I like the use of the verb ‘feele‘ here as in Middle English it means to experience a physical sensation, to be aware through pain or a sense of touch, as well as to have an emotional empathy with, ‘to feel’ in the modern sense. Feeling is a bodily and tactile sensation as well as an emotional reaction. Forgiffis thes men that dois me pyne. What thai wirke wotte thai noght. (My father, that all sorrows may cure, forgive these men that do me pain; what they work, they know not. Therefore, my Father, I crave, let their sins never be visited upon them, but save their souls). One of the things that interests me about Middle English lyrics is their representation of time and space. 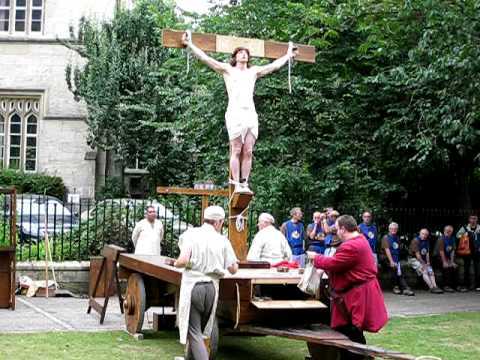 In the York play, Christ’s speech from the cross takes place at a real moment in his life story, when he is hanging on the cross, moments before his death. In the play cycle, Christ’s life and passion are re-enacted for the contemporary viewer in real time and in the real streets of the city (both medieval and modern, as the plays are regularly performed today). At this moment in the play, Christ asks for forgiveness for mankind’s sins but this forgiveness is still to come as he has not yet died and been resurrected in the timescale of the cycle, thus fulfilling his ultimate plan. In the lyric, I see time and space working a little differently. Christ’s speech from the cross is to some extent detached from the passion narrative. The voice speaking from the cross could just as easily be speaking from one of the ubiquitous devotional images of the crucifixion prevalent in the period, from personal devotional images such as Books of Hours (as pictured above) to communal images such as the crucifix on the rood screen in the parish church. Christ is still made present to the reader/viewer’s contemporary time, he is ‘hyngand’ (hanging) on the cross, but he speaks from a moment that is not so clearly tied to the historical narrative as it is in the York plays. He is able to speak about himself in the third person at the beginning of the lyric, ‘here what god hem-seluen says’ (hear what God himself says) and he is able to offer the promise of salvation immediately because his death and resurrection have already taken place. His forgiveness has already been granted and the lyric’s image of his crucified body is its guarantee. As long as we strive to sin no more and ask for Christ’s mercy, as the lyric instructs, his grace is assured. This entry was posted in Uncategorized and tagged Books of Hours, Christ, Crucifixion, Good Friday, Middle English Lyric, Passion, York Plays. Bookmark the permalink.